Have your first graders begin practicing mental math with this quick and easy routine! This set of daily word problems will have students solving problems and explaining their answers questions aligned with the common core standards! This set, for January, focuses on addition within 100. All you have to do is laminate, cut the page into four pieces, and go! That's it! You could technically use these problems for math journals if you want, but this routine actually involves no paper and no pencils! 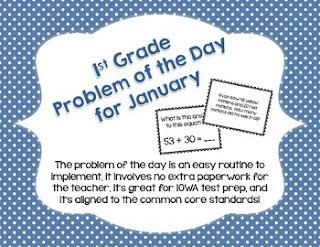 If your students take the IOWA test, you know that the test doesn't allow for students to use scrap paper to solve their math problems, so I use my problem of the day to have my students focus on counting with our fingers and beginning to practice mental math! WHAT TOPICS/STANDARDS DO THE OTHER MONTHS HELP TEACH/REINFORCE? Save 40% by getting the months as part of a BUNDLE!